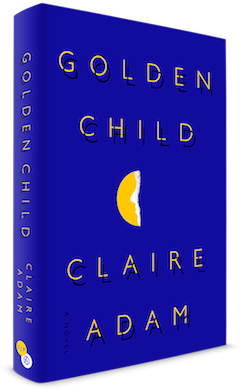 Claire Adam's intriguing debut novel, Golden Child, is an atmospheric read that poses provocative questions about familial duty, poverty, privilege and masculinity. Pivoting on a single act of violence and imbued with smaller, more mundane acts of cruelty, this is a luminous and heartbreaking tale of the complicated architecture of sacrifice. "They have two kinds of men in the world, Clyde thinks, two kinds of fathers. One kind works hard and brings all the money home and gives it to his wife to spend on the house and children. The other kind doesn't do that. And nobody can control which kind of father they get." 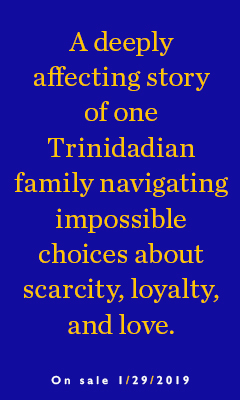 Set in rural Trinidad--Adam's homeland--during the 1980s, Golden Child tells the story of the Deyalsingh family. The father, Clyde, is a hardworking petrochemical employee who has dogged ideas about the worth and potential of his 13-year-old twin sons, Peter and Paul. Peter appears to be the golden child of the book's title. The near-silent and presumed "slow" Paul, on the other hand, was "deprived of oxygen at birth" and vexes his father to no end. The idea of robbing Peter to pay Paul sits at the center of what unfolds after Paul goes missing one day while out in the bush. Not long before Paul's disappearance, the Deyalsinghs' house is broken into while the twins and their mother, Joy, are home. Angry that Paul might have provoked the intruders into more aggressive acts, Clyde threatens his son with institutionalization. Later, at nightfall on the day Paul has gone missing, Clyde grows angrier, convinced that this is yet another way in which Paul intentionally undermines him and his plans for the family. While Clyde is mostly an unsympathetic figure, he occasionally stumbles in his convictions and emotional unassailability, struggling to keep worry and regret at bay as he resolutely searches for his missing son in the bush and throughout their neighborhood. Moving back and forth in time, from events leading up to Paul's disappearance to the immediate and long-term repercussions of his vanishing, Adam's finest talents as a writer arise when the story switches from Clyde's perspective to Paul's. This exposes Clyde as a slightly unreliable narrator (or, arguably, a more complicated one) and moves the story into Paul's nocturnal, reverie-like perceptions. So elegantly written is Paul's interior that it's tempting to think he is the golden child, not Peter. And when Peter's gushing teacher--who has plans for sending him to university--tells Clyde that he doesn't "understand the kind of child [Clyde has on his] hands," he's unintentionally speaking of Paul, too. Place and landscape mirror the boys' contrasting characters. The studious Peter, who has a steady and unquestionable love for his twin brother, is "like a foreigner in Trinidad" who "walks with a bold step." He is surely destined for greater accomplishments far away from home. His characterization is clean, minimal. Alternatively, Adam goes deep and poetic with Paul, who struggles with his education and "tends to slink around--like he's playing invisible." Seemingly vulnerable, yet with "a little bit of macho-man act, which maybe fends off... teasing," Paul, more tenacious than assumed, is a misunderstood, neglected, yet beautiful extension of Adam's construction of the Trinidadian bush. His nickname is "Tarzan" because of the long hair he vehemently refuses to cut. He is also more at home in the same bush that Clyde is so uncomfortable with--a disorienting and uncontrollable place where convicts lurk and "crazy naked [women]" run, where Shouter Baptists pass through and where "obeah patterns" can be found on the ground. The bush is a region of supposed "nonsense and superstition," a crossover from one challenging reality into another, more confounding one. Still, Clyde searches for Paul, his struggles with the flora and fauna of the bush mirroring his struggles with his son's way of engaging with the world. A cast of compelling, if sometimes fleeting, characters circles around the boys. Contrasting Clyde and his steely resolve about who his sons are and the lives they're meant to live is Peter and Paul's slightly passive and anxious mother, Joy. She consistently reiterates the importance of family, when not lamenting about "what God is doing to [her family]." There's Joy's bitter and shady brother, Romesh; the kind and supportive Uncle Vishnu; and Father Kavanagh, who rejects the idea that there's something "wrong" with Paul. Charismatic neighbors pop in and out, interacting with Clyde or Paul. Claire Adam was born and raised in Trinidad. 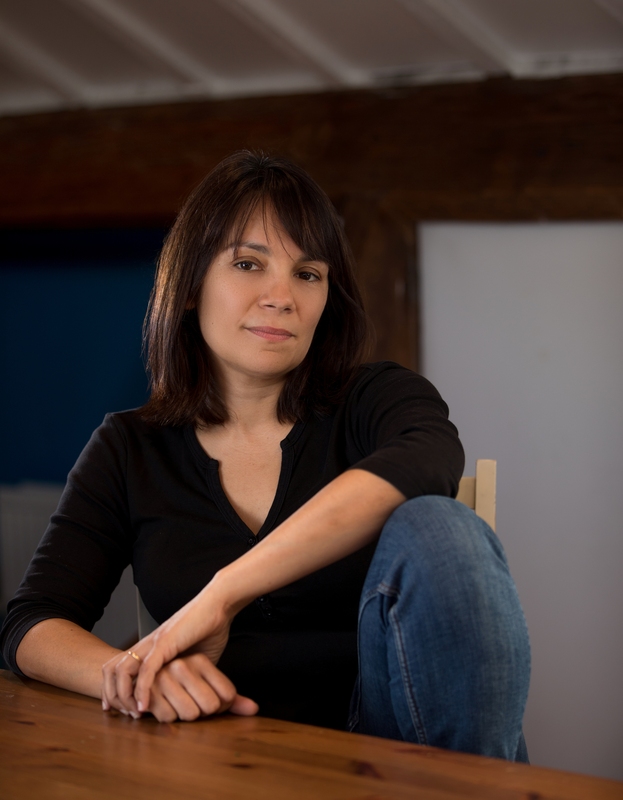 She studied Physics at Brown University and later took an M.A. in Creative Writing at Goldsmiths, University of London. She lives in London. 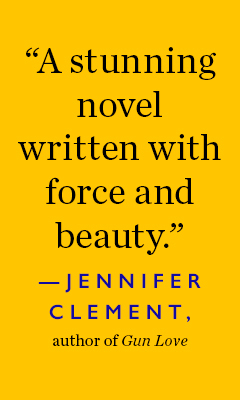 Golden Child (SJP for Hogarth, January 2019) is her debut novel. What was the impetus for this particular story to be your first in novel form? The impetus for this story was the father, Clyde. Before I really started work on this novel, Clyde had already taken up residence in my mind as a fully formed character. I knew the dilemmas he would face and what the eventual outcome would be. But I had to discover how events unfolded, figure out exactly who else was involved. I've always seen him as an intensely lonely man with a tendency to isolate himself because he considers it the only safe way to exist in the world--or at least in Trinidad, which is the world in which he lives. He's not always a likable character. You would think that I would have had the power to make him more likable, or to have him make decisions that people would find easy to live with, but I didn't feel like I had much power over Clyde. Sometimes it felt like Clyde was looking up at me from within his world, shaking his fist and telling me, "Don't you dare!" Don't you dare change me, he meant. If anything, I felt as if I was using my authorial power to protect him from the world's judgment. The more I explored Clyde's life, and his sons' lives, the more I discovered the people who were connected to them, people in the extended family, in the neighborhood, at school and so on. More characters kept appearing, each with their own struggles, personalities and histories. There was a point when I nearly despaired because it just became so big and unmanageable. But I kept coming back to Clyde, and eventually I found a way through it that seemed to make sense. Golden Child is, arguably, a complicated reflection on masculinity. Was that intentional? Not really. I didn't intend for it to be as male-dominated as it is; I'm not quite sure how that happened. I certainly wasn't thinking about masculinity being a theme when I wrote it. But it's true that the main characters are all men, or boys growing into men, and that each of them is under pressure of some kind; and it's also clear that the society they live in has pretty traditional expectations of men and women. Clyde doesn't share his problems with anyone, not even with his wife, Joy; he thinks things over in his own time, in his own way, which frustrates Joy, but once he's made up his mind, there's no going back. Peter, the more academic twin, is under a different kind of pressure--to do well at school, to live up to his family's expectations for him, and to make their sacrifices for him worthwhile. He also responds to this by locking himself away, taking a kind of tunnel vision in his devotion to his work. Paul, the other twin, isn't as bright as Peter and he knows it; he feels that he's loved less because of it. His strategy is just to try to learn how to survive on his own. Most of the violence in Golden Child is woven into the lives of your characters. What was it like exploring that part of the story? I'm not someone who gravitates toward violent movies or books, so I'm a bit surprised that I've ended up writing this book that contains elements of violence. But I felt it was important to reflect the precarious place these characters live in. It's not a place where, if a burglar breaks into your house, you call the police and five minutes later a police car arrives with its sirens blaring and order is quickly restored. People routinely employ private security companies because they have no faith in the police. It's basically every man for himself, and violence is inevitable. I was pretty restrained with the violence portrayed in the book; I certainly worked hard to make sure it wasn't gratuitous. It would have been easy to overplay the crime, but it would have given the impression that Trinidad is some kind of war zone, which it's not. Many people live happily, or are wealthy even by international standards, yet this exists side by side with universally shocking crime. The chapters written from Paul's point of view are particularly beautiful. What was it like writing him? It took me a while to figure Paul out. He was the second twin to be born and had some problems at birth. It's not clear whether or not something's actually wrong with him, but the doubt overshadows his childhood and causes his father to favor Peter. He and Clyde don't get on very well, I knew that from the start. But I was trying to figure out the reasons. Whenever I tried to bring Paul to mind, he was just murky and shapeless. I thought of maybe structuring the novel to remove the chapters written from his point of view, but I felt like that was a cheat. Eventually, I could see him clearly in particular scenes--sitting by the river or walking along the roadside at night--and then it was easy to write him. What other stories do you hope to tell?